Now that I’m not occupied by episode after episode of TV shows, I can finally catch up on my blog rather than keeping a queue of all the things I want to blog about. In my attempt to go somewhere new every weekend, I chose to go to Freiburg im Breisgau last Saturday. I woke up early in the morning at around 5 and got ready to leave the house at 6:30. I probably woke up my landlord’s family downstairs from the running water while I showered, but I unfortunately, I can’t really do anything about that. I figured leaving an hour early to meet up with my friend at a train station that only takes half an hour to get to should give me quite a bit of flex time. Half an hour seemed like a lot to me, until I saw how long I had to wait for my train. I waited a whole twenty minutes for it. The worst part about the wait was that I never charged my iPod. I stood around and silently waited. Kind of like watching grass grow. Although in retrospect, I could have left the house a little later, but at least I wouldn’t miss my train. After meeting up with my friend, I we patiently waited for the train. From the corner of my eye, I saw something tiny moving around on the tracks. An animal? It was a mouse, or a rat. I don’t know the difference. I tried my best to catch a picture of it while it zipped around and underneath the train tracks. It kind of felt like playing that old N64 game, Pokemon Snap. If this was Pokemon Snap, I would have gotten a low score for that picture. While walking around the train station trying to kill time, we found a place that sold 5 Berliners for 2 euro. 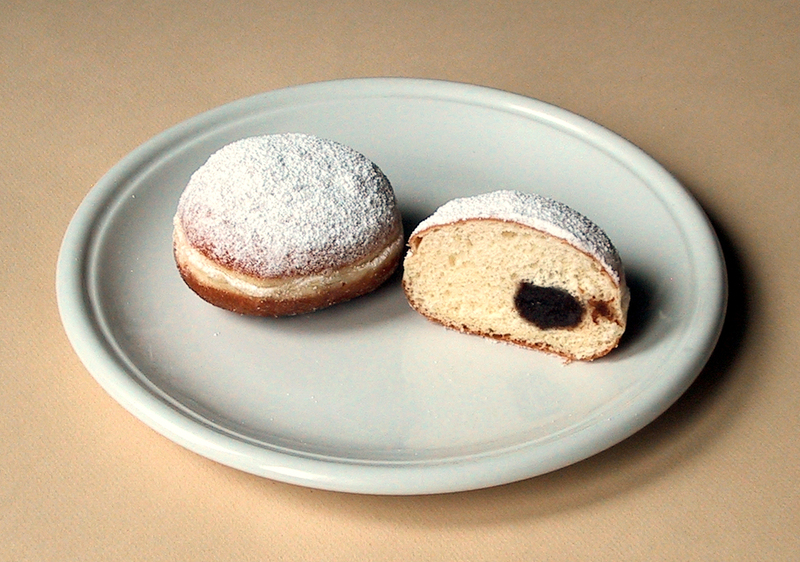 Although called a Berliner, it clearly has nothing to do with someone from Berlin. Despite the misleading name, Berliners are a pastry that is like a European version of a doughnut (never ever call it that). It’s got sugar on top and jam filling on the inside. After boarding the connecting train, I talked to my friend about how long train rides were. I don’t know if it’s because English attracts attention, but a random stranger sitting across from us started talking saying how it is perfectly normal for train rides to take a long time. Since he was German and probably didn’t get a lot of practice with English, he spoke to us with a heavy accent. He started talking about how sometimes people will commit suicide by train, which causes trains to stop in the middle of nowhere and everyone on board is forbidden to get out. The weirdest part of it was that train suicides were seasonal. According to him, more people commit suicide by train in the summer. After speaking to him a little more, I found that even some Germans read manga. I didn’t know that manga was that popular. I even saw Dragon Ball manga translated in German in a bookstore. Ich bin ein Super Saiyan? Two train transfers and three and a half hours later, we arrived in Freiburg im Breisgau. According to Wikipedia, it’s the warmest place in Germany. As usual, the first thing we do upon arriving at a new place is to look for a map to find the tourist information center to get a map. I had already looked up what sights to see the night before, so all I needed was a map to tell me how to get there. Even without the map, we could both see the tower of the Freiburger Munster standing tall above every building in its vicinity. All we needed to do was head in that direction. Thus far, the Freiburger Munster is the most amazing work of church architecture I have seen, inside and outside (The only place that I think could be better is the Sistine Chapel, but I haven’t been there yet). I would describe it, but I’m terrible at descriptive writing. Good thing is that a picture is worth a thousand words! After walking around inside for a little bit, I came across a set of statues in front of a window set up in a way that a group of statues were all looking at the body of Jesus Christ. When I was looking at these statues, it happened to be around noon, and the sunlight shined through the window and I could see the glare. It seems as if the scene was designed this way: to have the Light of God shine down. Walking around some more, I came across a statue that looked suspiciously like Chancellor Palpatine of Star Wars (there’s my nerdiness popping up again). Who knows, maybe George Lucas got inspiration from this and found an actor that looks like the guy in this statue. On our way out, we learned that we could visit the church tower. Despite the popularity of the church tower, there was no elevator (makes sense, since the church is quite old) and had a set of the narrowest spiral staircases ever seen. Two people could barely pass through each other. One wrong step would cause one to tumble around and around down to the bottom and bring other people along in a human snowball. Luckily for me, that did not happen, but it sure was tiring walking up all those steps. At the top, we had a semi decent view of the town. I say semi-decent because of the maintenance that was going on. For three weeks in a row, every main attraction in each city I went to was under maintenance. There was the Heidelberg Castle, Bebenhausen Abbey, and now this. In addition to being able to look around town, I also saw the mechanism for the church bells. On our way out of the cathedral, we smelled a strong scent of bratwurst and because of that, I decided that’s what i was going to have for lunch. I guess my lunch was like a European hotdog (I have no idea what they call it). They took a bread roll, cut it in half and put bratwurst and onions inside. Like everyone else, I added ketchup and mustard. I don’t think I can go back to eating regular North American sausages again after eating bratwurst. A unique feature of the city is that water canals run through the town. Upon first sight, one would think they were some sort of sewage system. Known as Bachle, they were once used to provide water for firefighting and feed farm animals. It is said that whoever steps in one must marry a Freiburger. Around the town are a set of gates. One of them, the Martinstor, has now been desecrated by McDonald’s. How they managed to put their brand on such a historic structure is beyond me. In the city is also a trail that leads up to the mountain, Schlossberg, for a view of the town. I believe there was also public transportation that took the lazy folks up there. As if the stairs at the church bell tower wasn’t even enough, we were now faced with yet another seemingly endless set of stairs. We’d look up the mountain seeing how much further we needed to go every now and then. Once we reached the top, we realized that it wasn’t really the top. There was yet another set of staircases leading up. It’s just that we couldn’t see it before we got all the way up. On our way home, I came across a vandalized billboard on the side of the street. The vandals had drawn a Hitler mustache on the peoples faces. I found it kind of amusing since that doesn’t really happen in North America. Not Hitler mustaches, anyway. Mini Hitlers and an Old Man Hitler? On the train ride home yet another random stranger talked to us. Except that the stranger this time wasn’t German. He was an American who had just arrived in Stuttgart to work. Like us, he spent his weekend traveling. My friend and I were talking about gun control at the time when the guy started talking to us. Apparently in his state of Virginia, one has the right to shoot someone in self defense to take someone’s life when their own is in danger. He even told us a story about how someone he knew shot at a guy sneaking around suspiciously in their yard and how a friend of his has a license to carry a concealed weapon around. It felt kind of nice to hear North American English again. At the train station, while waiting for a connecting train, a third random stranger started talking to me. Three in one day. That has to be a record. This time it wasn’t because I was speaking English. This time it was because I’m Chinese. A Turkish looking fellow looked at me as he walked by pushing a cart of luggage. He looked at me and said “ni hao”, which is hello in Mandarin. I was so surprised that I didn’t know how to reply, all I did was smile back in appreciation. I guess Chinese people are a rare sight around here. For some reason, on the train ride home, the train stopped suddenly in the middle of nowhere. I was reminded by the German fellow I talked to earlier about train suicides and I hoped that it didn’t happen. Fortunately, it wasn’t anything serious and the train continued on its way after a few minutes. After a nice day of sightseeing and hiking around, I got home and rested for the next day, which I spent uploading photos, blogging, and random household chores. Sounds like quite the opposite in excitement compared to the day before.